Voila Berryl Sling-Handbag + Pouch are both made of birkin textured full grain cow leather. Voila Berryl has soft, tender, fllexible, and supple genuine leather character, coated with its color availabilities – Black, Orange, Red, Tosca, and Mocca(coffee and chocolate mixed color) and paired with a beautiful pouch that can fit in precisely in the bag and can be removed out to carry around in your hand or sling it over your shoulder. 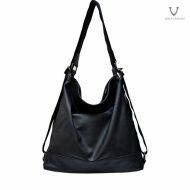 Voila Berryl Sling-Handbag + Pouch is designed beautiful, elegant, simple to wear on your everyday daily activities or to parties with friends, family, and coleagues. Voila Berryl is perfect matched with feminine fashion, work outfits or even casual. “Simply Classy and Beauty”, it’s how we illustrate our new release bag,Voila Berryl Sling-Handbag + Pouch, a women’s medium sized Sling-Handbag combination paired with a small pouch. Voila Berryl is classy, elegant, classic, simple designed sling-handbag combination handmade by our experienced leather craftsmen using supple, flexible, soft, tender, non-rigid birkin textured full grain leather. Voila Berryl, a simple box shape designed bag available in elegant black, bright orange, bright red, bright tosca, and exotic mocca (coffee-chocolate mix), accessorized with leather strap as an option if you prefer to carry it over your shoulder. Voila Berryl has main chamber wrapped with soft and smooth canvas fabric lining, safe for keeping your valuables, and has 2 magnetic button locks for easy access. Voila Berryl paired with a beautiful pouch that can fit in precisely in the bag and can be removed out to carry around in your hand or sling it over your shoulder. Voila Berryl Sling Bag + Pouch is designed beautiful, elegant, simple, timeless, strong, long-lasting, made of genuine leather for you, classy genuine leather bag lover to complement your looks on your everyday daily activities or to parties with friends, family, and coleagues. Voila Berryl is suitable matched with feminine fashion, work outfits or even casual. 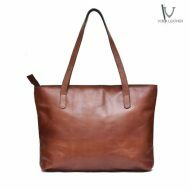 If you are looking for a strong premium genuine leather bag designed classy, classic, and simple, Voila Berryl deserves a spot in you bag collection shelf.